Around 1825, the point at which emigration generally (and to Canada in particular) began to be seen as a cure for widespread poverty and joblessness in England, certain English writers began arguing that the vocation of middle-class emigrants was to recreate the English class system in Canada by becoming a new landed gentry. Carter Hanson calls this "the ideology of the landed vocation." 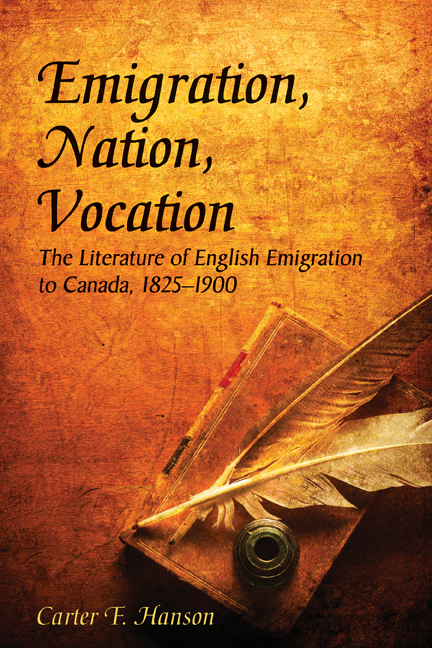 Emigration, Nation, Vocation explores how and why this ideology gained currency, its cultural impact on middle-class emigrants, and how the ideology evolved as it went into decline during the 1880s. This careful study establishes the enormous impact had by class-based discourses of work and nationality on the consciousness of middle-class emigrants as they attempted to adapt to life in Canada. The complexities of transcultural identity formation examined here are suggestive of the many ambivalent forms of postcolonial identity that pervade contemporary Canadian literature and society. Carter F. Hanson is Associate Professor of English at Valparaiso University in Valparaiso, Indiana.